Institute of Dermatology, Catholic University, Rome, Italy. Case presentation. 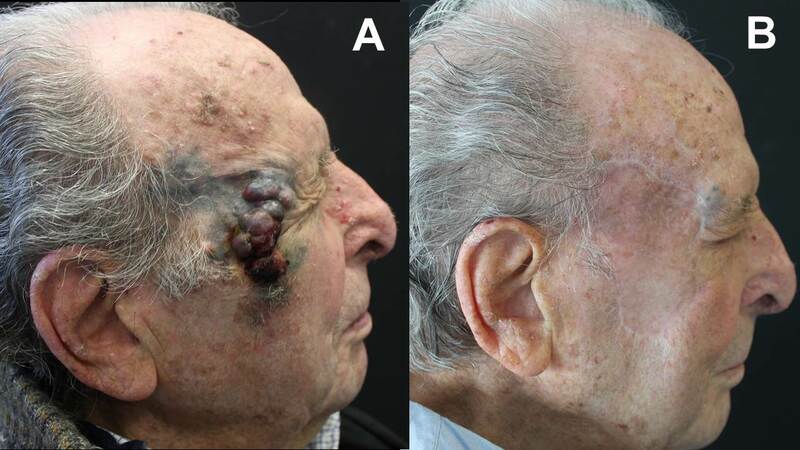 A 91-year-old man was examined for the presence of a large, long-standing pigmented lesion on the face, which rapidly increased in size during the last months. Physical examination showed a 9 x 7 cm plaque with variegated colors and undefined borders containing red to dark brown to black nodules, two of which were ulcerated, located on the right temporal and malar region (Figure 1A). The nodules had appeared four months earlier on a flat, brown to grey pigmented lesion of approximately 20-year duration, which had been previously treated, by other Institutes, with cryotherapy, laser therapy and surgical excision. Clinical and dermoscopic features were compatible with the diagnosis of melanoma. The patient had no other skin lesions suspicious of malignancy, no major comorbidities and no symptoms, and he still had an active occupational and social life. Diagnostic work-up, treatment and outcome. 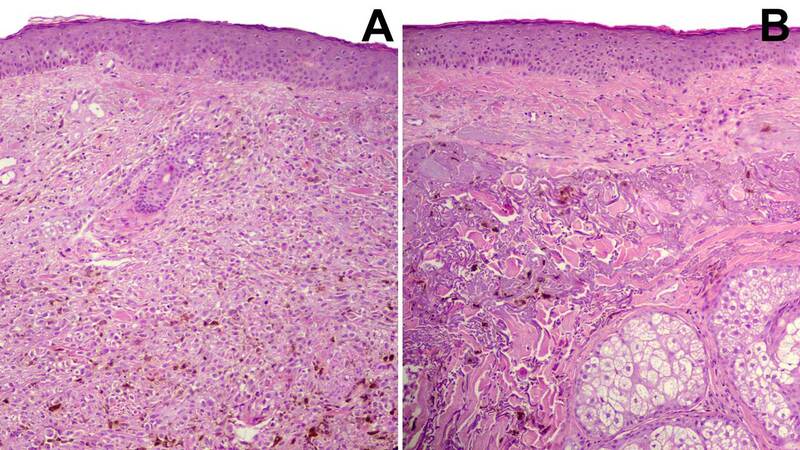 Two incisional biopsies were performed, one on the nodular (Figure 2A) and one on the flat component (Figure 2 B); the histopathologic examination confirmed the diagnosis of cutaneous melanoma, showing in the first biopsy a confluent dermal nodule of pleomorphic melanocytes (Figure 2A), and in the second one a superficial band of dermal fibrosis, severe solar elastosis with sparse atypical cells and melanophages (Figure 2 B). Melanoma cells resulted BRAF wild-type at molecular testing. A total body CT scan revealed two lung metastases, one of which located in the right superior lobe and another one in the left superior lobes (T4bN0M1b, according to the AJCC 8th edition). As suggested by the multidisciplinary team, the patient underwent surgical excision of the entire lesion on the temporal region with subsequent skin graft (Figure 1B), and 4 weeks later treatment with the anti-PD1 pembrolizumab (2 mg/kg every three weeks) was initiated. After 42 weeks the patient is still under treatment with no evidence of recurrence of cutaneous lesions and reduction in size of lung metastases. The patient had no adverse events during treatment and continued to perform his daily activity with an excellent quality of life. The treatment paradigm of metastatic melanoma has changed dramatically with the introduction of immune checkpoint inhibitors and targeted therapy. Indeed, the most recent data showed that the median overall survival in patients with metastatic melanoma treated with pembrolizumab is 55% after 24 months. Our case shows that an adequate surgical approach followed by immunotherapy with pembrolizumab can be successfully employed also in elderly patients, providing a good quality of life.